Productive Mama Bottom Line: Make an effort to switch to dried beans. It saves you a ton of money and it doesn’t take that much time, I promise. A can of beans yields about 1.5 cups of beans. A can of organic beans, on sale, seems to currently run for $2. I last bought organic dried black beans on sale for $2.39/lb. A pound of beans will yield me about 6 cups of cooked beans, equivalent to four cans of beans. Four cans of beans would be at least $8. A pound of dried beans is $2.39. So you’re paying nearly FOUR TIMES as much for the canned beans. I once again defer to Katie over at Kitchen Stewardship. She has done a thorough job breaking down EVERYTHING BEANS. If you’re a nerdy over-researcher (I’m with ya), her page on beans breaks it all down. You’ll love it. 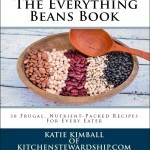 In fact, I suggest you buy her awesome ebook titled The Everything Beans Book. I have it and love it. The book and her page on beans will show you price breakdowns, soaking methods, cooking methods and so much more. Here is my simplified method to give you a few simple steps to take you from canned to dried with relative ease. This is what I do to save the most time and to get into the DRIED bean habit. Soak beans overnight. This takes very little time. 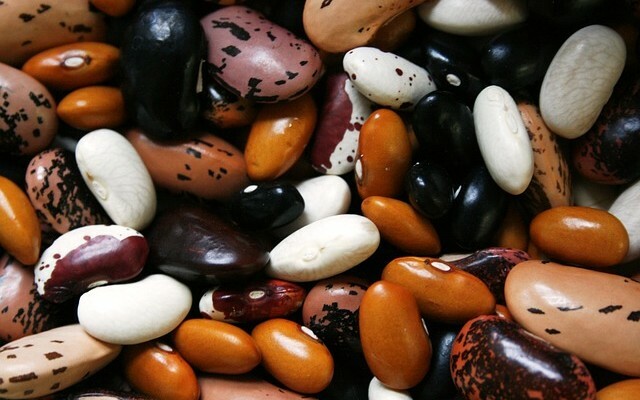 Dump beans in a bowl or your crockpot or instant pot insert. I put in a drop of iodine. You can add whatever you like to help with gas during the soak or during cooking. For planning purposes, expect the beans to about double in size. The next morning, pour off the soaking water. Cover beans with fresh water. If you using a crockpot, turn it on low and let it cook all day. If you using an instant pot, set it for whatever the book tells you. Then just let it sit for a natural release. Let the beans cool. Drain. Use right away, store some in the fridge or bag them in portion sizes to freeze. Now you won’t have to cook beans for awhile. You have cooked beans ready to defrost. You can also soak all day and let them cook overnight, draining and bagging in the morning. You could also cook the beans in whatever spices you prefer. If I want to cook dried beans in a specific dish, I soak them for 12-24 hours, pour off the water and then start the recipe with the soaked beans. And sometimes, when I soak too many to handle in one batch or I want run out of time or space, I soak beans and then freeze the soaked-but-not-cooked beans, making sure to label them as such, for finishing later. There are a lot of approaches to dried beans and more recipes than I’ll ever know. But this is how I work them into my life with ease. I admit I have a can or two of beans on hand for “emergencies,” but I have not actually used them in emergencies. I end up using them just so they don’t get too old! And I made the best beans EVER in the pressure cooker. I couldn’t believe how perfect they were. Just sautéed some garlic, then added in the beans, about 1/4 cup of nice chile powder, 35 mins then natural pressure release. Bagged them up and froze them. So proud of myself! You’re totally right. Oops! Updated. I haven’t done seasoned beans in the instant pot yet. But they do turn out great “plain,” in it for sure. And whoa, your chile powder must not me NM hot because that much of ours would kill me! Sounds like you are set for beans during the pantry challenge!